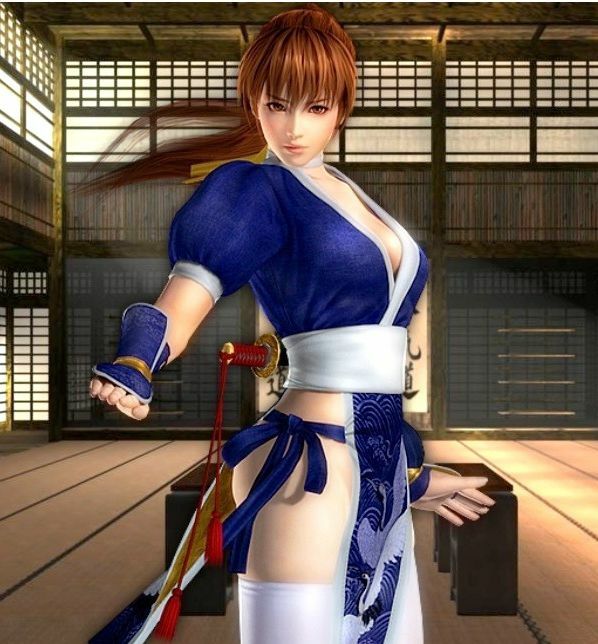 As the official face of the Dead or Alive franchise (and winner of the first DOA Tournament), Kasumi is instantly recognizable. She’s deadly (trained in Mugen Tenshin ninjutsu), kind hearted, sincere, and with measurements of 35-21-33, to say she’s “well put together” would be an understatement. We’ve seen her frolicking on the beach playing volleyball in DOA Extreme Volleyball. She’s now a playable character in the Ninja Gaiden series. She’s even available in a series of popular collectible figurines in Japan (it’s possible we may have picked one up for our offices during our last visit to the Tokyo Game Show). Her half-sister Ayane (who looks almost identical to Kasumi, except for her short purple hair), is a hottie in her own right. And if you can’t get enough Kasumi, you’ll be glad to know that she’s been cloned multiple times. That’s no surprise to us — if we had the technology to clone this Japanese beauty, we’d make a few ourselves! Kasumi’s look has matured a bit over the years, but she’s always been the hottest player of her franchise (which is known for its gorgeous girls), and one of the most recognizable female video game characters worldwide. She’s also favorite cos-play character, since her wardrobe is just as “well developed” as the rest of her. She’s the third and final redhead of our countdown, and even though our voting only allowed us to rank her #3, she’ll always be #1 in our hearts.